The chaos of a move provides the perfect conditions for breaking something. You are running around, cleaning out closets, moving around furniture, maybe even trying to stage your house at the same time because it hasn’t sold yet. If you are wondering what you can do to help protect your fragile items that you are storing before the move, below are some tips that will help you ensure that everything that is coming with you on the move arrives in one piece and in good condition. If you are storing things like electronics before a big move (televisions, stereos, projectors) the best thing you can do is make sure that everything is stored in its original box. The original box is designed to protect the electronics during the long voyage across the sea, and then from the port to the store, and finally to your home. If you are packing fragile things before the move, the best thing you can do is make sure that you have the proper packing supplies around to ensure they are well protected. This means things like packing peanuts, foam, and durable enough boxes that small bumps and knocks are not going to damage the contents. You can pick these things up at self storage facilities or packing stores. If you are really worried about the safety of fragile items before a move, a self storage unit might be your best bet. This is especially true if you have items that require a climate controlled environment, or things that are especially valuable that you want to ensure are receiving around the clock protection. A temporary self storage unit might just be the peace of mind you are looking for. Whether you are stacking boxes in a self storage unit, or in your own home, if they contain fragile items, never put them on the bottom. Fragile boxes always go on top. Additionally, don’t stack the boxes too high. 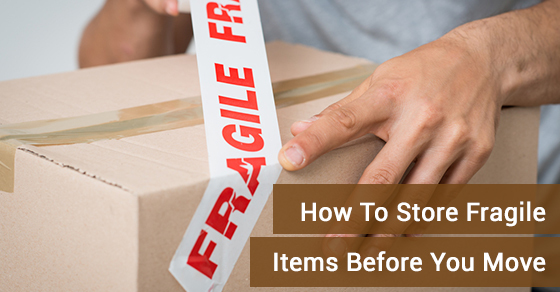 Where fragile items are concerned, always try to keep the stack to a minimum (if you need to stack at all), and never have things like glass or electronics in the boxes on the bottom of the stack. Moving is hectic and you don’t want to make it any more complicated than it needs to be. If you are worried about your fragile items, keep the above pre-move storage tips in mind and rest easy knowing your fragile items are safe and sound.